Here's a few cards I've made lately. Most were just quickie cards as I haven't had much time for stamping lately. Another Family Ties, this one adults. I'm realizing now looking at it that I never colored his face--oops. Still needs some embellishments, too. Stardust papers. This one is my first attempt with my new Threading Water punch that I have been looking for forever, at least a year. We had a new Jo-Ann's open here. Not only did they have it, but it was 40% off--can't beat that :) Stamps are Sweet N' Sassy; colors are Crystal Blue and Twilight. I have my copy of the ne CTMH catalog and WOWSA!! I am so in love! THis is my favorite catalog. So many fun new embellishments and papers. I'm saving up for a big order now! Here's a sneak peek at the cover. 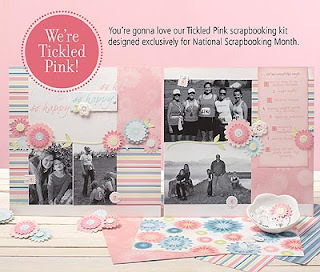 CTMH also has a fabulous promotion going on for National Scrapbook Month--Tickled Pink. This kit includes Glitter papers, Textured Cardstock, Die Cuts, Mini-Medleys and even a stamp set. It also comes with an instruction guide for creating gorgeous projects. Best of all, you can earn it for FREE! 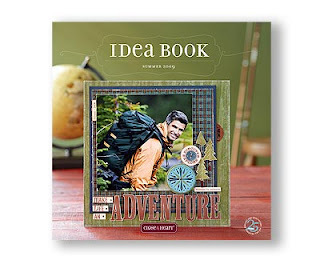 Be sure to check out the scrapbook contest and blog CTMH has going on right now. Go to http://www.scrapbookandshare.com/ for more details or click the button on the right side of my page. People have posted some fabulous layouts already! Your cards are darling! I love that golf one. I am a big fan of the threading water punch too - it is awesome. Great cards, love the soccer one. super cute cards. love the soccer one. And, I have that punch too and love it! glad you finally found it. the new catty looks great. have fun! Oh now thanks for the "manly" cards inspiration...LOL! I always struggle with this type of card. And you did a terrific job! Thanks for sharing!